For the first 2 years we lived in our section of our neighborhood, we were pretty much alone. We were one of the first houses that built and it took a few years for things to really take off. So, imagine my excitement when I was strolling Grayson a year and a half ago and I realized the people that bought the house right next door had a CAR SEAT! and a STROLLER! I immediately went up the driveway to introduce myself to Andy, Leslianna, and little Gray. I was so excited to see this cute little family with a daughter close in age to G moving in right next door to us! Fast forward to now & this family has become one of our closest couple friends. I know it's not just a coincidence that they ended up as our neighbors; it's definitely a God thing. Over the past year they have been going through the adoption process. 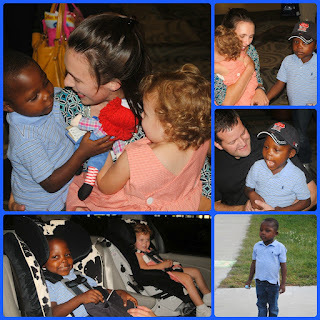 Last winter they were matched with a little boy in the Congo. His name was Eli & he was the same age as Gray. I can't imagine knowing you have a child that far away, seeing pictures and videos, and not being able to go get him right then & there. I know it was such a long, hard wait. Well, for the past 2 weeks our sweet friends were in Africa preparing to bring Eli home! We have been so excited about this for so long! It was a long (and very quiet and boring) 2 weeks on our street without our neighbors. Grayson was missing Gray like crazy! Yesterday was the big day. The day that they would walk through the terminal in the Nashville airport and be HOME as a family of 4! It was such a special moment to see Gray meeting her new brother for the first time. It was amazing to see the little boy we have been praying for over the past year standing right in front of us! This family is so precious to us & we are so thankful for their friendship. Watching them go through this whole process has changed my heart. It's such a reminder of God's love for us! Oh I love this!!! What a blessing!